The First World War sparked innovation in medicine and technology at a rate unseen in almost any other period of history. The work of talented metalworker and inventor John Chandler is today largely forgotten but the legacies of his inventions live on. John Edgar Chandler was born in Cheltenham in 1873. A new documentary film created by University of Gloucestershire students explores his contribution to the war effort. His father Charles was a furniture dealer. He married Louisa Matthews (daughter of a carpenter) at Cheltenham Parish church in 1895 and at that time he gave his profession at an art metalworker. By 1901 John is listed as a truck hand cart maker and general smith trading at 6 Beaufort Buildings. The couple had one daughter, Miriam Ivy who was born in 1908. The last census before WW1 shows him working as a blacksmith and furniture dealer at 56 Winchcombe Street. He was secretary of the Cheltenham Y.M.C.A. for 5 years and involved with St John’s Church. Chandler was a talented art metalworker who had a forge near Pittville Gates. 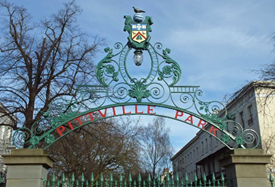 It is believed that the top ornamental arch added to the gates in 1897 was created by him. He later worked for the company H.H. Martyn who were specialists in architectural decoration. 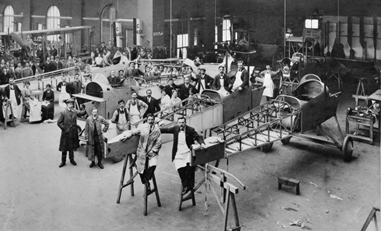 The company diversified in the First World War and formed the Gloster Aircraft Co. It was a pioneering age and technology progressed rapidly during the war. Chandler was described by author John Whitaker in his book about the firm as having a “fertile and inventive brain”. From what we know of John Chandler he certainly appears to fit the stereotype of the brilliant and eccentric inventor. For example the story goes that he fitted a small mirror into his glasses so he could see over his shoulder as he believed that people in the street behind him were mocking him. 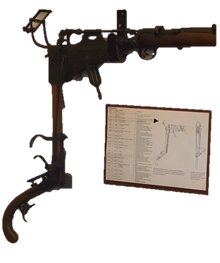 Whilst perhaps this is an unusual origin for a piece of military engineering, it lead to Chandler designing and patenting a periscope/hyposcope rifle site (for standard issue Lee Enfield rifles used by the British Army at that time) allowing troops to fire over the top of the trench without risking sniper bullets. The design (left) combined his metal work and carpentry skills for this piece of potentially lifesaving equipment for British soldiers. Chandler’s design allowed soldiers to, load and fire the weapon using a system of mirrors and leavers without having to put their head above the trench. Chandler’s design was effective and elegant but somewhat ornate for the frontline environment. He also seems to have been somewhat conflicted about his invention. For example whilst the periscope site could potentially be seen as a life saving device for British soldiers fighting on the front line, it appears he became uncomfortable about profiting from it and discontinued his work before the design was widely adopted. 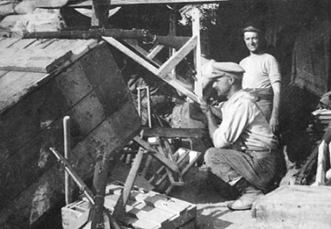 Other simpler and more practical designs for similar devices (right) were created by other inventors the most notable the simple box periscope design used with great effect by the Australians at Gallipoli. By 1915 Chandler initiated the creation of the Gloucestershire Surgical Appliances Co. With financial support from A.W. Martyn (of the Gloster Aircraft Co.) and encouragement from Dr Grace Billings (Cheltenham’s first female doctor, who was heavily involved with the local VAD hospitals during the war). He developed pioneering medical equipment for disabled servicemen, specialising medical splints and leg supports for paralysis and arthritis. He managed the surgical company throughout the war and in 1919 bought control from the Gloster Aircraft Company. He felt great gratitude to A.W. Martyn for helping him to start and eventually take over the company and his daughter describes in John Whittakers book that it “enriched and fulfilled his life”. He carried on with his endeavours for the rest of his life until his death in 1931. The best insight into Chandler’s character is perhaps the summary of his life in his obituary and the first hand opinions he expressed in the local papers. Predominantly his early letters were about municipal matters but during war other issues were addressed. A 1916 article in the echo about invention he sent to the home office that would have potentially prevented a Zeppelin raidreally gives a feel for his slightly sarcastic sense of humour but also his intensity. In February 1917 a series of controversial letters appear in the local paper between Chandler and an anonymous correspondent ‘Zero’. Chandler states that he was writing as a non-conformist but expressed some concerns about ‘Religion at the front’. Religion seems to have been important to Chandler and his family. His father is described as having had evangelical tendencies and wrote hymns under the pen name O.B. Cheerful. John himself seems to have been involved for a number of years with St John’s Church and the Cheltenham Y.M.C.A. In many ways it is possible that this is one of the driving factors for Chandler’s decision to discontinue production of the rifle site and instead devote the rest of his life to assisting the wounded and ill. Although we have no photographs of Chandler his legacy lives on in the work he created, many of the medical devices and equipment he designed was used in hospitals across the world right up to the 1970s.